In February a short story I wrote was released in the Art of War anthology for charity, alongside many accomplished authors. It was an honour to be included, and a great way to support such a worthwhile charity. February was also manuscript delivery time for SHADOW OF THE EXILE to 47North, followed by rounds of developmental edits later on, copy edits, and everything else which accompanies a release like cover design, the description, promotional text, etc. At the same time as all this was going on I was in discussions with Joshua Bilmes at JABberwocky, who offered representation later in the year. You can read all about that here. So why all these other novels and not the sequel to REVENANT WINDS yet? To put it simply, it was in the best interests of my career, and my goal of remaining a full-time author, to have multiple new works in good shape and ready to pitch or self publish. As an author, you are the CEO of You, Inc., and it is very difficult to build a long term career without having multiple irons in the fire. You have to plan years ahead and set out what books are priority and what it’s in your best interests to focus on first. Yes, some readers will be disappointed, but they would be even more disappointed if you have to give up writing and find other work to keep a roof over your head and food on the table. But 2019 is here now, and I have finally returned to REVENANT WINDS 2, while at the same time managing multiple revisions of my S&S novel and the first few novels in my hexalogy. I also have a third book planned for after DAWN OF THE EXILE (yay Tarrik! ), but at the moment I lack the time to make steady progress. On top of all this, I also have another secret project that I’m working on (more planning for the future…), but I can’t say much more about it at the moment as it’s in the very early stages. What I can say, is that it’s set in my Sorcery Ascendant world and my agent Joshua is very pleased with what he’s seen so far. With any luck, sometime in 2019 I’ll be able to announce a sale of print and ebook rights of my THE NECROMANCER’S KEY hexalogy, and perhaps even for my secret project! And if no publisher bites, then THE NECROMANCER’S KEY will be self published. My heartfelt thanks yet again to everyone who bought my books, or left a review, or helped keep me sane on social media. I hope everyone has a wonderful 2019! Announcement! I have signed with Joshua Bilmes, the president of JABberwocky Literary Agency. Yes, you read that correctly. Joshua Bilmes at JABberwocky offered representation which I accepted. Joshua has a stellar record which speaks for itself, and he represents skillful and celebrated authors such as Brandon Sanderson, Peter V. Brett, Michael J. Sullivan, Elizabeth Moon, and Myke Cole, to name a few. I’ve been keeping this exciting potential development under wraps for a while, as Joshua and I had numerous phone calls and emails, discussed my career so far and what I’m working on, and he considered the first book in a new hexalogy I’m writing. As I’ve stated previously, my goal is to follow the hybrid author path — that is, to pursue indie publishing along with traditional publishing deals. And this is massive and welcome step which will hopefully open many doors. As an author, you are the CEO of You, Inc., and an entrepreneur. My goals center around creating quality books and products, building a long term career, and growing a sustainable income that enables me to spend more time writing. Signing with such a reputable agent is akin to collaborating with a business partner to achieve mutually beneficial goals. I have many years of writing ahead of me, and plenty of ideas and books I’m working on (too many at once, possibly!). And with some self published works released, a trilogy with HarperVoyager, a duology with 47North, and various deals with Audible, this is just the beginning! I hope you’ll join me on this exciting ride, as it could be a wild one! 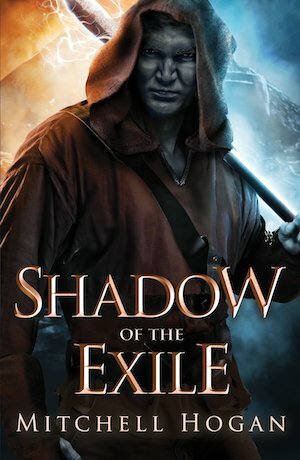 SHADOW OF THE EXILE -- released! SHADOW OF THE EXILE has been released by 47North! You can pick up a copy here at Amazon or if you prefer audiobooks at Audible. As this book is published by 47North (Amazon Publishing’s SFF imprint), it is only available on Kindle, Audible, and as a paperback.